This week in our Early Learning series, we're covering STEM. Science, Technology, Engineering, and Math are all over the place these days. And there is good reason, too. STEM learning is present in classrooms, summer camps, after-school programs, and even library programs. Today, I'm sharing classic STEM. This is the STEM of my childhood and one that I'm so excited to share with my kids: Tinker Toys! 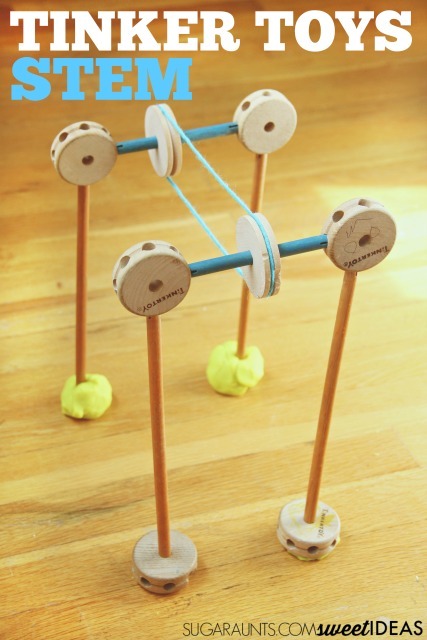 We used the classic toy, Tinker Toys with STEM concepts to create a Tinker Toy pulley. Now, this was fun! Science with Tinker Toys- We talked about the physics behind a pulley system, including the load and the effort required to make the pulley work. Our pulley was designed to pull a string along a strait path to carry a load from one point to another. We talked about energy with our pulley. 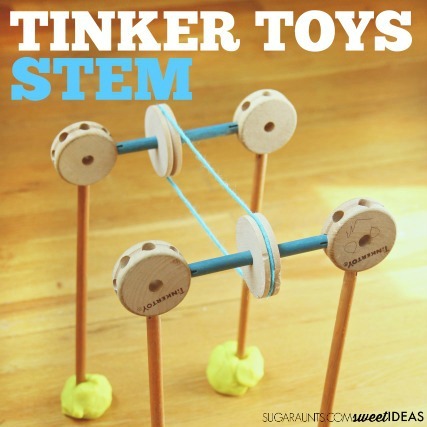 Technology with Tinker Toys- I've read that the technology portion of STEM learning can relate to any product made that meets a need or want, including items like a pencil or a chair. Our technology was the machine (the pulley) that could transport items from one place to another. We created a machine to do a job. 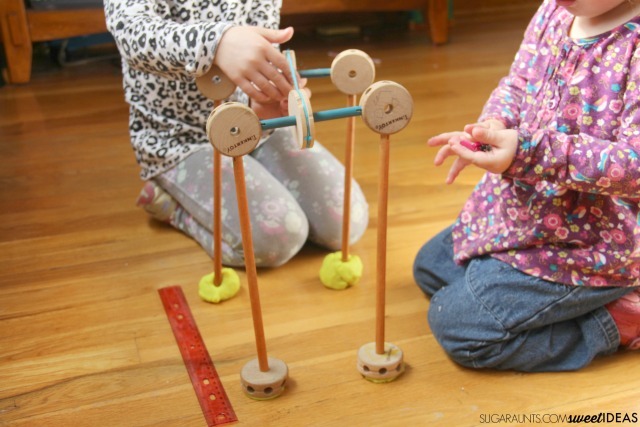 Engineering with Tinker Toys- Tinker Toys might be one of the most classic engineering toys there is. Children of all ages have used these building toys to create whatever their imagination could dream up. We were able to engineer a pulley system with trial and error to find the right height, length, and support for our pulley. After trial and error, we determined that our pulley needed a better base of support. To adjust for lack of width in the base, we added play dough to hold the legs in place. Math with Tinker Toys- For our pulley, we tried different lengths of string. We measured the lengths and decided on the best length to pull clothes pins from one point to anther. We then added more clothes pins and noted how much the string drooped when we added more pins. We then had to adjust the distance of the pulley legs to accommodate the weight. 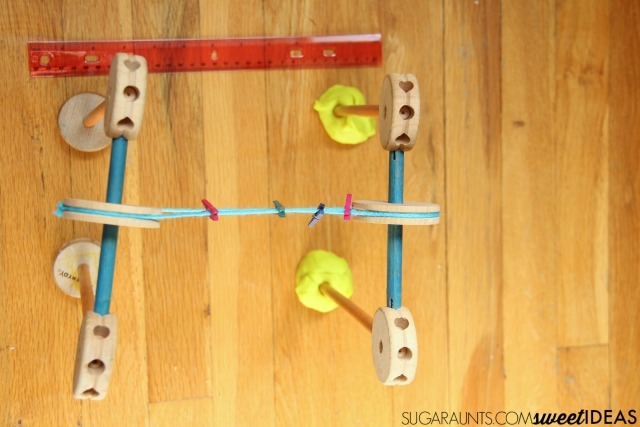 What a great way to combine math and engineering in this "tinkering" STEM activity! NOTE: Our clothes pins were multi-colored but I'm not able to find that exact item anymore. You are able to purchase individual colors of clothes pins, here. Tell me, did you play with Tinker Toys as a kid? 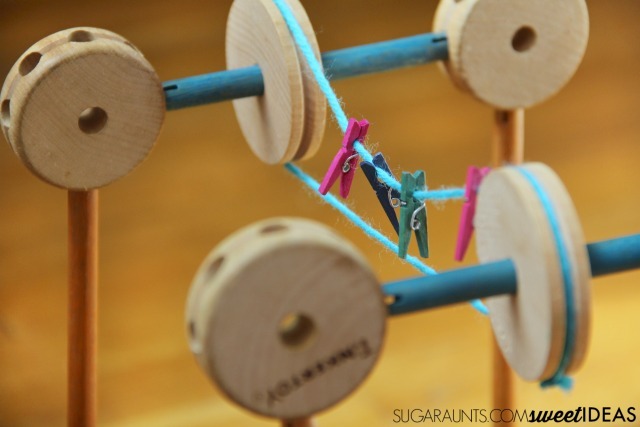 Have you ever made a pulley as a child? Join our newsletter subscriber list for lots of freebies! Sign up HERE.